You are currently browsing the daily archive for June 1, 2012. 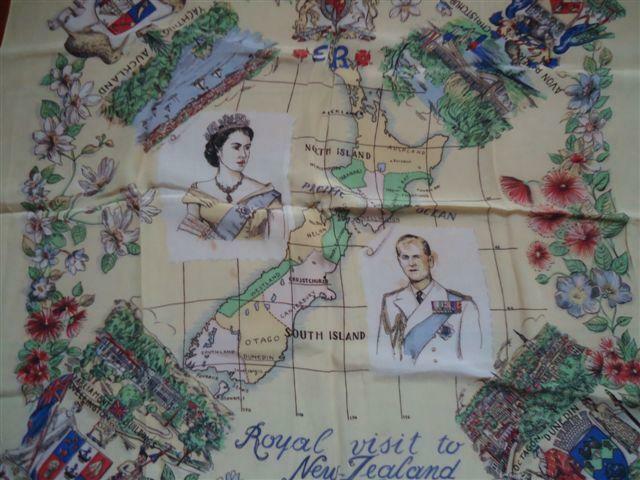 With the upcoming Diamond Jubilee celebration of HM Queen Elizabeth II and a long weekend for New Zealanders, thought I’d display a few royal pieces of linen. “Those who were children at the time recall the BIG Day, marked for months in the calendar, when they dressed in their posh clothes, pinned a royal tour medallion to their chests, collected a butter box to stand on, a Union Jack to wave, and perhaps a periscope to look through, and set out to ‘see’ the Queen”. There was a frenzy of commemorative products ranging from wooden rulers, drinking glasses and lots of china. Plates are easy to find but examples of linen marking this significant tour which ran from 23 December 1953 to 31 January 1954 is a little bit more challenging. 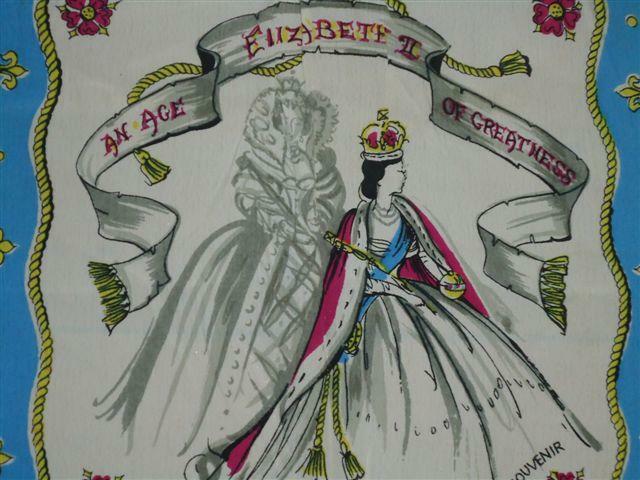 The Queen’s earlier Coronation in June 1953 produced a frenzy of items including the following two scarves. This larger and more colourful example was found recently at a stall. A number of china plates produced for the Coronation were later sold for the New Zealand tour with new tour stamps added on the back of the plates. Would have been a different and more difficult situation to re-brand the older linen products. 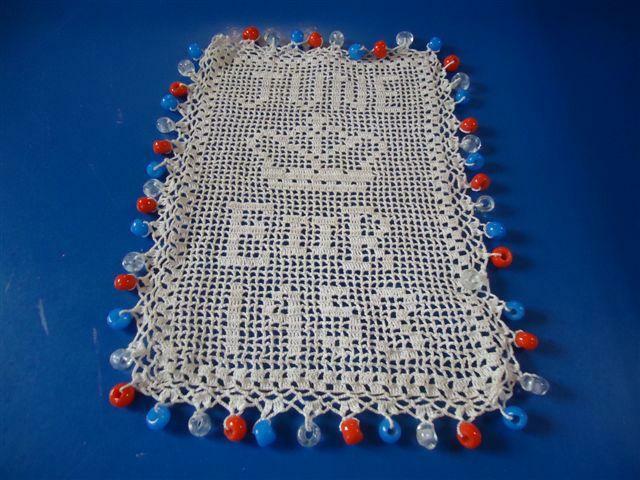 Also the proud owner of the following delightful milk jug cover which is completed with red and blue beads. 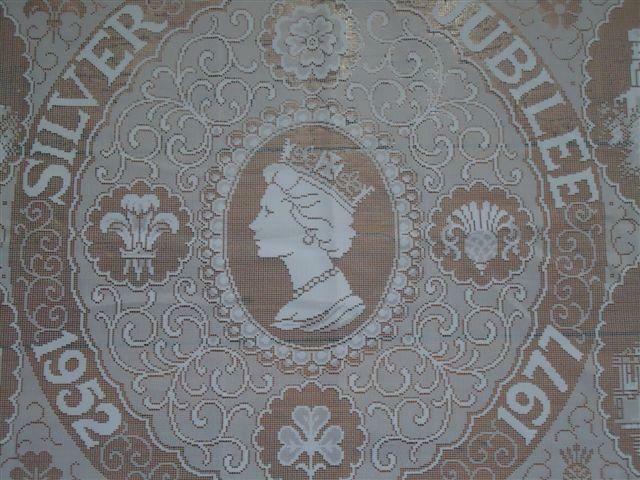 This example of Silver Jubilee lace was given to me by a colleague – don’t you love receiving unwanted treasures from others? 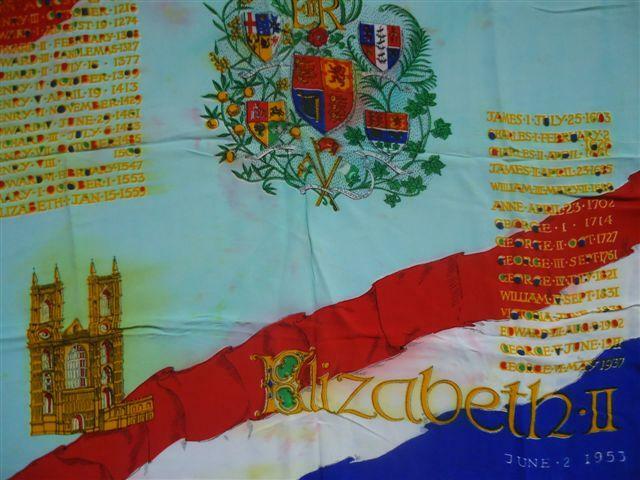 Will be interesting to see if any linen commemorative pieces are produced for the Diamond Jubilee. Have spotted lots of china plates, figurines and even corgis but still looking for a classic tea towel to mark the occassion.